Andrew works for a company that hires plant machinery to building sites. His job today involves collecting a digger on an articulated lorry with a 44 tonne gross vehicle weight. 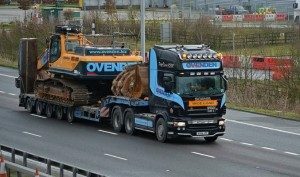 It is a short 10 mile route to collect the digger which takes him through a city centre, on a motorway and past a Driver & Vehicle Standards Agency checkpoint. After he has loaded the digger he decides to take a detour which is just over 22 miles in distance. What type of trailer is most likely being used? What will Andrew not need to check on his daily walk round of the vehicle? Who is responsible for making sure the load is secure? What should Andrew do before he departs with his load? What is the most likely reason Andrew is taking a detour? 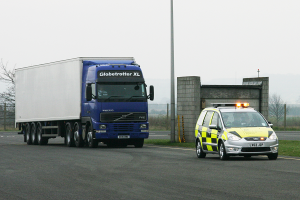 Why would the Driver & Vehicle Standards Agency be stopping large goods vehicles?